Palm tree branches decorated the dancing room. On the walls, banners with sentences, some of them incomplete. Over 2.000 people gathered at the gafieira (a place where people usually dance samba) Som de Cristal for the party and Gilberto Gil and Caetano Veloso’s show. Nara Leão, Maria Bethânia, Dalva de Oliveira, Dircinha and Linda Batista were also there. The Tropicalista party started at 1 am and went on until 4 am. After that, they went out for supper. Palm tree branches decorated the dancing room. On the walls, expressions printed on banners: Não tem problema (No problem); Quem te viu quem te vê (you’re unrecognizable); Criança não verás (child, you won’t see); E agora José? (what now, José? ); Vai que é mole (go for it, it’s a piece of cake); Deixa comigo (I’ll do it); Primo você é que é feliz (cousin, you’re the happy one); Não teremos destruído se não destruirmos as ruínas (we won’t have destroyed it if we don’t destroy the ruins); Não faltará pescado na semana santa (we won’t be out of fish during Easter week). Back at the end of the room there was a stand; in its center, two stages: the empty one had been taken by the public; on the other, the orchestra’s crooner, dressed in white, was singing a samba. It was eleven-thirty. The party was to begin at 11 p.m., but the Tropicalistas had not arrived yet. The news that Vicente Celestino- who would also participate on the program – had died started to spread. -“That’s just gossip to make the party better. I bet he’ll show up when his turn comes”, a woman said. It was past midnight when it was announced that the singer had really died. The hosts were in doubt whether to go on with the show, but they knew that if the singer were alive he would have preferred to, so they did. At 1h15 am, some of the assistants started to scream: “Caetano! Caetano! Caetano!” The singer was arriving. He was dressed in red, wearing a black cape, with a yellow fluffy scarf on his neck. Dedé, his wife, was coming along. Then Os Mutantes and Gilberto Gil arrived, with a black cape on. Also arrived Nara Leão and some singers from the “Velha Guarda”: Araci de Almeida and the sisters Linda and Dircinha Batista. Chacrinha! Tropicalismo é tribute! Tropicalismo é demagogy! -Tropicalismo is a question of good sense. -Tropicalismo is às margens plácidas (an extract from Brazil’s National Hino), it is watching O Direito de Nascer (a Brazilian soap opera), Tropicalismo is a blessing from the heavens! Tropicalismo is open on Brazilian television! At this point, everybody sings “Chiquita Bacana”. 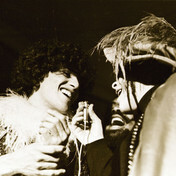 Then Caetano sings “Tropicália”. The public sings along. From the back of the room, comes a procession with the night’s performers. The ones at the front are carrying a bull skull stuck on a piece of wood. Behind them, come angels, candles, long, psychedelic colored clothes. -It is the mess Festival, someone comments. Still, the spectators applaud and keep on applauding when Caetano sings again and, afterwards, Os Mutantes. The applause intensify when Gil sings Miserere Nobis, with the lights flashing in and out at the end of the song. The singers go on: Nara, Os Mutantes, Caetano again, Dalva de Oliveira, Linda Batista, Dircinha Batista. Beside them, Araci de Almeida sings a Noel Rosa’s song. On her white sports blouse we read BH2OH! During a pausing moment, Chacrinha starts to sing one of Caetano’s songs and talks to the singer. Then, it is Maria Bethânia’s turn. All the singers are together now, in front of the TV cameras. Holding each-other, they sing and dance Gil’s Bat Macumba. The spectators applaud and sing along. The party is coming to an end.